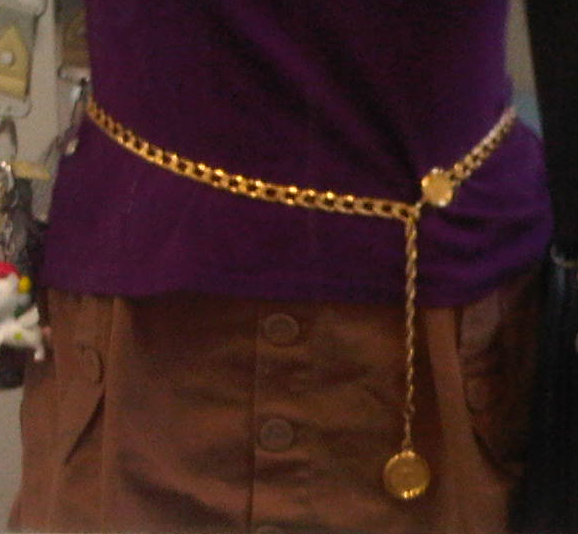 I love wearing belts to spice up my outfit, and of course I can't live without chain belts. However, one of the issues that I face with chain belts is that I'm worried about the belts unhooking themselves. Especially when I sit down, the belt may accidentally be pushed around and the hook can come off. I can't bear to lose my belts, especially the vintage ones that are hard to come by. Hence, I devised a solution for the problem! It helps to secure the belt to prevent it from dropping off, and also keeps the belt from moving around so that the buckle will remain in the correct position. And not just normal safety pins- I used the largest one that I could get at the craft shop. 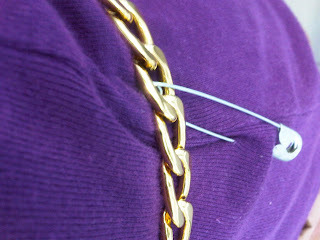 I pinned the belt down at the side of my top, and it's a discrete way of securing the belt. Before pinning the belt on, I positioned the belt in such a way that I could see the buckle at the front. Keeps the belt from "running" around. Safety pins are versatile, and it lets me wear my vintage belt with an ease of mind!